For the most part this idea only effects Ranged and Melee combat, and this will be difficult to amend so long as Magic is predominantly weaponless (or rather, without class-specific weapons). Ideas of mine such as Conjuring and Firearms would provide Magic the equipment it requires to truly utilise this idea; but wands and—to some extent—staffs will also allow it. This update doesn't require that players interact more than they already do. 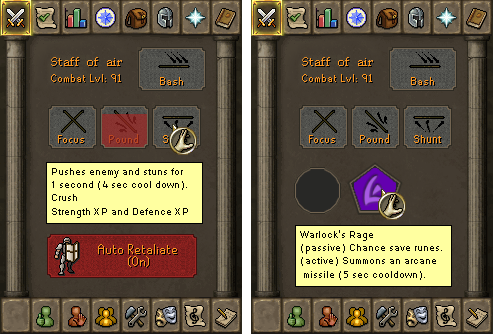 In a nutshell, the entirety of the current Combat Styles panel can be found in the top and bottom line of the revised panel: the weapon name, combat level, attack styles (accessed via right click) and auto-retaliate. The special attack is the only feature to have changed (see on). • Between two and three perks (aka "abilities", "alternate attacks" or simply "attacks"). • A circle augment slot. • Between zero and two specialized augments slots. This image includes some features that have yet to be explained, but read on. Shields would be given a single slot, which isn't lost upon trade (similar to the circle slot). The shape of the shield-slot can vary (for weapons such as Anti-Dragonfire and Spirit Shields), but this for the most part this will be a standard shape. Perks have effects, the simplest of which being an instant attack. Each perk has a cool down which takes effect when the weapon is first equip, as well as between attacks. An attack that is in cool down will be coloured red, which will slowly drain to illustrate the time left (this could also feature a number in seconds over the top)(the transition of the drain could either be a top-to-bottom drain, or a countdown/clockstyle). In case you didn't catch that, newly equip weapons won't have any available perks instantly (unless they have no cool-down) - thus, switching weapons will not bypass cool downs. Augments too have effects, and come in two varieties: active and passive. Active effects come into effect when the icon is clicked (can be both one-off and duration based); whilst passive effects are always in effect whilst the augment is in use. "Active" effects have cool downs just like perks, and just like perks these cool downs will come into effect when the weapon is first equip (an active cool down will not effect any passive effects). 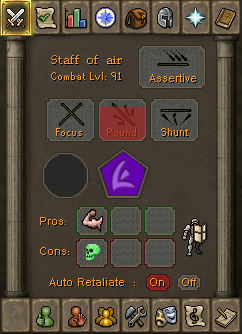 Regarding my comment at the top, the lack of special attack bar is the only part of this suggestion which impacts the current combat system (as all other features are optional). 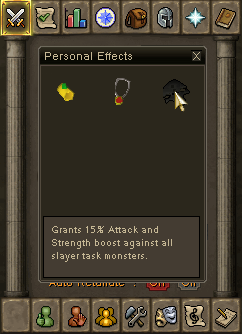 Special attacks will appear as active effects on augments (unless their effects are changed as part of the update, I reckon Excalibur's Sanctuary should have an area-of-effect passive too); removing the special attack bar. Players who use a single weapon will likely find this update beneficial, as they can use attacks more frequently; whilst players who weapon-hop will find this detrimental, as there is no global control for special attacks (and switching weapons will in fact reset any active cool downs). • Triangle - Ranged-based augments. • Square - Melee-based augments. • Pentagon - Magic-based augments. • Hexagon - Ranged-strength augments. • Rectangle - Melee-strength augments. • Heptagon - Magic-strength augments. • Rhombus - Standard weapon augments. (mix of speed, damage and defence). • Dragon - Draconic Visage. • Spirit - Spirit Sigils. Augments can be obtained as direct drops, from weapons/weapon drops and as rewards. Some augments are bound to the weapon that they are found in, such as Dragon Weapons and most existing weapons with special attacks or set-effects. A bound augment is always circular. A weapon with customized augments cannot be traded. If dropped, any non-bound augments will be dropped loose (inadvertently this will probably be the quickest way to clear augments from an item)(non-tradeable augments won't be visible to other players). Upon being traded a weapon will lose one of it's default number of specialized augment slots (this can remove all specialized augment slots)(the circle slot is not affected by this). Hopefully, this loss can occur at the recipient's side so that players can drop and reprise their own items (such as in event of death) without damaging their weapon... although, this could be a penalty of death (and thus don't bother, just have it happen when dropped)(although this would make my dropping-to-remove comment undesirable). The premise of slot loss is to award getting it an item for yourself without making it non-tradeable, and thus no longer worth obtaining. It's possible that augments could have level requirements to insert, or to use. Although, ideally, the requirement to wield the weapon should be the only limitation on this system. Percentage effects would be the best solution... something such as Dragon's Rage isn't overpowered at low levels (although I'd imagine it's expensive), as it's 15%. An added pro to the slot-loss system is that, unless the low-level acquires the item themselves, the item may not have a pentagon slot in the first place. 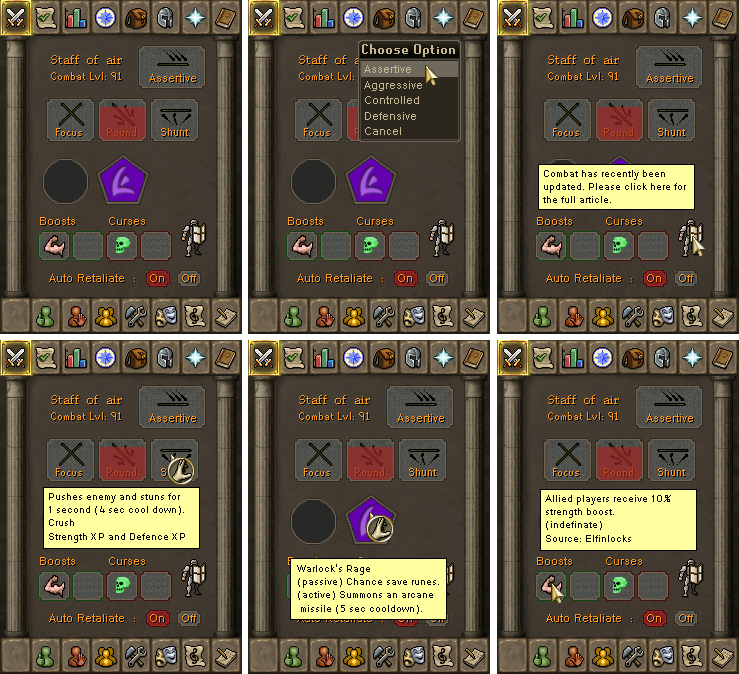 Proposed that augments could be player-made, or at least some of them. For example, unstrung amulet could be enchanted as that to create augments. These would be circular, and thus generic/non-specific in their effects. The image shows that Pound has recently been used. The Shunt attack, which the player is viewing, knocks the enemy back one pace, and stuns them for one second. This perk is designed to stall, and his no impact on the damage dealt (although damage dealt would still be required for the effect to activate). The player is also using the Warlock's Rage augment, which has two abilities: a passive ability that will occasionally save runes; and an active ability that will cast a free spell (with a 5 second cool down). Warlock's Rage is not bound, and can be removed and placed in another weapon. This spoiler denotes a now-unused functionality. The difference in the image is the default attack, here "Bash", now "Assertive" to denote the experience type. The reason for this change was that the reasons behind it did not outweigh the predicted public outrage. The motivation behind using only a single experience type per default attack was to create a need for unused weapons types as players would not be able to easily train all their melee-combat skills on a single weapon choice. For example, a dagger would only be useful for training Attack, whilst a battleaxe would be used to train Strength and spears still being used to train both at once. Note I said "easily train", as most weapons will feature perks that would earn experience in the other skills and so training all combat stills is still possible with one weapon (it's just not pure-friendly). This was replaced with the ability to right-click. • Defensive be the only option available via right-click, perhaps even not available on all weapons. • There is a toggle to enable defence, but this wouldn't allow defence-only. • Defence experience from perks is substantial enough to replace the lack of defence-style, but this still doesn't allow for defence-only. • Perhaps one-handed weapons may only have a maximum of two perks, and equipping a shield or secondary weapon will add an additional perk that will allow for defence experience (again, this doesn't allow for defence-only. Affliction slots display those effects provided by consumables/allies or inflicted by enemies, rather than passive effects provided by your own equipment (such as augments and prayers). Whilst I've jokingly used the little warrior icon to display a message, that icon could bring up a full list of personal effects (such as the Slayer Mask, etc.). The strength amulet current doesn't actually provide any effects, I just grabbed a random amulet. It could, however, provide an area-of-effect strength bonus? Something like a taunt/battlecry maybe? Rally the troops! These slots only display duration-based effects (anything which lasts for longer than the instant it was used). This will either be indefinite (so long as whatever's causing it is around) or a timer. In practical terms, the only things that aren't displayed here are boosts like Vengeance and Cure Other/Group, which activate instantly, and Blood spells, which have no lasting effect. Something such as Cure Other could have a resulting effect, "Recently Cured", which grants temporary immunity from poison (which I think potions currently do, but I'm not sure about cure spells). A player cannot be affected by any more than there are slots available - so a player that is poisoned and diseased cannot be further afflicted. You can ignore/remove boosts by right-clicking on them, however, curses cannot be removed without appropriate action (such as an anti-poison potion). In the event that you have no available slots and someone tries to use something, there are instances where your current effects might be temporarily (or permanently) replaced. For example, temporary boosts will take precedence over passive boosts (as you'll get the passive back when it's done). This isn't normally the case for curses, as getting poisoned might be considered a safe-guard to more powerful area-of-effect curses (which wouldn't be fair). To make things easier, most effects would be given some sort of priority rating. Also, like-effects (such as poison and specific skill boosts) would replace weaker effects. Effects such as those aforementioned generally won't stack, but this would (again) be case-by-case. Displaying boosts/curses: yay or nay? Additional boosts/curses similar to that depicted: yay or nay? See the bottom half of post 1, no-one's commented on that feature yet. I say yay to both of them. Most unique weapons are still an obvious category. But YES! Do it. Well here goes. This list is probably not entirely definitive, but its a good start. I apologise that it appears muddled, but thats because I went through it in no particular order. I've tried to group any ambiguous weapons based on what their stats best fit them to, for example, the barrelchest anchor, being slow, but strong and 2 handed, went in with the mauls. • Pentagon - Quarterstaves, ALL staves and wands, the only possible exception being the staff of light? Oh, and by the way. When I put weapons into the circle category, thats basically me saying "these shouldn't get any specific slots"
I'm not sure, but wouldn't weapons like the Silverlight, Darklight and Excalibur benefit more being classed as Longswords? 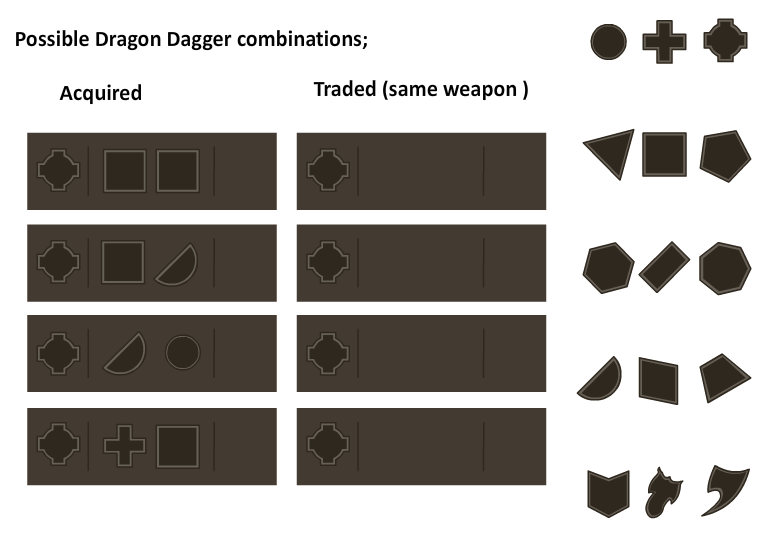 Also, those were only suggested shapes... you could have changed them entirely. I was going to propose that a weapon should fit into multiple categories (similar to staffs) such that when you acquire one... which custom slots it has are random. A staff could have one pentagon and one hexagon, two pentagons or two hexagons. This adds some need to acquire something more than once, in case your first isn't the best it could be. (3dit: I noticed you removed staves from hexagon ). At the moment, all weapons only have one category but up to two slots. Although, I suppose using multiple augments of the same kind that some effects could be listed as "unique" and thus doesn't stack (not all, just those that would be incredibly broken to use multiple). Very good list, though. I think you covered it all. Also, I got that about the circle. Aha... I see what you mean. Light weapon and heavy weapon could be two augment slots, as all light weapons use speed and all heavy weapons use power... but these aren't specific to class or weapon type. Maybe even one based on a minimum requirement of the weapon? So, a high-levelled slot (functions similar to the circle slot, but specifically for high-levelled equipment). Actually, that doesn't work. Ignore me again. Most high levelled equipment has a bound augment (which goes in the circle slot)... so changing the shape of it, and calling it an "ancient augment" is pointless since you can't customise it and it might as well just be a circle. Besides, cross is probably a valuable shape. Oooh! What if, if you manage to make enough shapes that they have them randomly generated, the ancient slots works like a shiny Pokémon (not quite as rare)... there's a chance you'll get it as one of your custom slots. This slot is either only compatible with ancient augments, which would be the rarest, or compatible with cross, circle and ancient augments (making it useful for players who want multiple circle slots). I don't know, I'll let you do it. If you can get three going for some/most/each, that would be awesome! 'cause then, since you can only ever have two maximum, it would mean that you're always missing out and there's always room to experiment! Interesting. I think your idea could be incorporated... Certainly, I think I'll need more shapes anyway if you use what I've come up with. They should all be pretty self explanatory... If an augment boosts your attack speed, it goes into that category, if it has prayer related boosts, it goes there etc. This'll allow me to match augment slots to weapons a lot easier, for example, I can give maces the prayer slot because they already have a prayer bonus, while fast weapons like whips and rapiers can get the speed slot. I think you only need Mage Strength and Ranged Strength. Things like speed, defence, etc, could be non-class-specific. Although, how does Defence differ from Shield? And what are "Unique Slot" 1 and 2? Assuming Generic is still Circle, then bound and generic go in the same place (combat panel wise) - so I'm not sure whether listing them separate confuses matters? If you have Mozilla Firefox you will find it incredibly useful for creating tables. Guaranteed slot is probably an unnecessary consumption of page-space. All weapons will have a circle slot guaranteed - which for common weapons will be empty and for most legendary weapons it has a bound augment. Unique is possibly a waste of an augment. However! ...when you put the argument in the perspective that bound augments almost seem like punishment—rather than a control over-empowerment—I agree with you. Perhaps—and this is the easiest solution—simply add circle to the list of available random slots. Just to clarify, the "number of slots" means possible slots? I'm not sure unique needs to be unique. The way you described unique, it's essentially a generic augment. I'm going to have a bash at creating the list. Or rather, shape'ifying the list. Like I said, I was planning on having some weapons without generic as their guaranteed augment, like the abyssal whip - its such a speed based weapon that I thought it should have guaranteed speed. You say this doesn't matter because any weapon that deserves better than generic augments will have their special attack, but if we go through with keeping special attacks separate, then weapons should get their specials AND a guaranteed augment, so a Dragon Dagger would get special, generic and then either attack, speed or helper, for example. It seems like a lot, but dragon weapons are meant to be stronger than their rune counterparts. Slayer10090 wrote: Like I said, I was planning on having some weapons without generic as their guaranteed augment, like the abyssal whip - its such a speed based weapon that I thought it should have guaranteed speed. You say this doesn't matter because any weapon that deserves better than generic augments will have their special attack, but if we go through with keeping special attacks separate, then weapons should get their specials AND a guaranteed augment, so a Dragon Dagger would get special, generic and then either attack, speed or helper, for example. It seems like a lot, but dragon weapons are meant to be stronger than their rune counterparts. For the whip, just make speed slots more common for the custom slots... thus, multiple speed slots. Having special attacks as a bound augment means that traded whips cannot be customized so easily as the number of custom slots is reduced (if any at all, as Dark suggests). I suppose special attacks could be perks instead of augments, but that would reduce the number of perks. Unless I make the buttons EVEN smaller, or but a bar or something underneath (wouldn't be the same as the special attack bar, it would feature exactly the same as the perks - how they are timed, etc). E'yeah... that's probably too many, if I'm honest. Even if effects are unique. I mean like... the point of this added variation in slots was so that a any two weapon has different potential [circle + square] or [square + rhombus] or [circle + circle] (two circles being most very extremely super rare). Unless you were including "generic" in the count, which all weapons would have. Thus "three" is actually "two + guaranteed"? I have two drastically different understandings of what you mean by "3". Parallelogram - Standard weapon augments. (mix of speed, damage and defence). Helper, I think support effects should appear as passive/passive-group effects on other augments. Constitution is a generic, and so is covered by circle/crossed-circle, and all other skills have their respective augment slots. I don't see how Helper justifies being separate. Dagger has +circle, like everything, and can have circle, square and rhombus slots for it's other slots. Maybe? Hmm. Theres some things I agree with and some things I disagree with here. Now then, I actually support your idea to scrap helper augments, but not for the reason you've given. It's occurred to be that by giving positive side effects to other players actually encourages people to do things in a group - they can benefit from eachother even if they don't know eachother, and it seems really rather sporting to me. I think it'll help players make friends too. 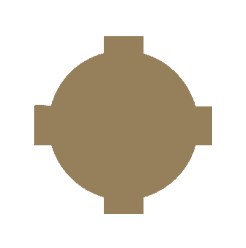 (Must remember to not use .png or add a background... transparent fail). Crossed-circle - High-levelled generic and bound augments. Rhombus - Standard weapon augments. (mix of speed, damage and defence). I don't understand the issue with special attacks, given that other augments will provide attacks also. That's the "active" part of an augment's effect. Special attacks won't become undervalued... and any that are would be an update to match the rest of the augment system. A special attack being a bound-augment will only effect traded weapons. It will not hinder players who obtain it themselves. (I would include PVP as a means to obtain the weapon without slot-loss... but there's no way to ensure it's honest PVP and not just someone trading via intentional death). Excellent. That all makes sense. So, whats the next step we take? I think immediately we need to get some opinions other than ours, then, once we're sure that everyone agrees with our masterplan, we need to start finalising details, drawing up tables, getting the augments themselves together. Agreed? Or have I gone crazy? Ummm, yes, other people should probably have a look. But it's not like we're updating the game ourselves... if we post this, we'll have a whole forum of feedback. We should start creating a database of augments. 3mptylord wrote: What are some basic stats that players/weapons have in other games? On the RSCF we briefly discussed things like critical hits, regeneration rates, etc, it would be interesting to try and work these in. Some off the top of my head: Health, Health Regen, Mana, Mana Regen, Rage (although this is more of an effect in most cases... become more powerful with consecutive hits), Shield, Speed (movement), Attacks Per Second, Armour, Critical Chance and Dodge. I never pursued this at the time because we were busy, but--while we're updating combat--tweak some player stats? It would give augments some extra things to effect aside from skills? I mean, some of those above already exist... but imagine an augment that doubles the health regen rate of all allied players? It seems, that so long as most augments aren't stronger than special attacks, what you suggest shouldn't be a problem. However, if it is, then the special attack becomes a burden. Augments themselves. Most of what you suggest above can be fitted without much adaptation into a augment shape, so I'll leave them to you. I'm gonna go round the 5 pages we've got so far and get all augments that have been put forward into one place. If you'd then be so kind as to then get the list we have into the first post, we'd be making great progress. Pacify - (generic circle, active) makes all enemies non-aggressive for 15 seconds - great in crowded multicombat areas, but obviously totally ineffective in PVP. Cooldown of 45 seconds. Much like the shadow-silk hood, it would not work on bosses, and might perhaps need to be ineffective in some quest situations too. I like the idea of this, or variations with different timings, being the Lumbridge task augment, because while its not too powerful, it could be really really useful to new players and makes a good introduction into the augment system. You know, special attacks could just be improved so that they remain "special". For example, most special attacks at the moment only feature an "active" effect, whilst the new augment system would be compatible with multiple effects. Thus, it would make sense to update existing special attacks. Excalibur's Sanctuary Augment. 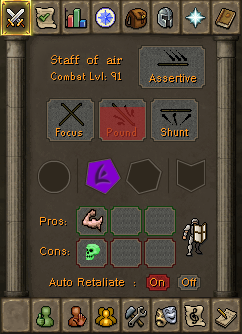 (Active) Raises players defence by 8 levels. (Passive, Unique) Raises allied players strength by 1 level when fighting the same target. P.S. You missed the huge list of existing augments. Quick smash, Shove, Retainer, Powershot and Leaf-blade. By "existing augment" and "no current augment" in the last two: the weapons citing "existing augment" are weapons that have a special attack (and thus an augment has already been listed, which the effect can be passive on). The other, "no augment" ones do not have a special attack... thus there is no current special attack name for them to piggyback. Claws, Flames and Strike should all be non-bound, but uniquely shaped (despite Claws currently being the only one at present (both Guthix and Void Knight)). The only source of the augments would be the staffs (which are non-tradeable), but the augments can also be placed in the books. The augment would still have charges, regardless of if in the staff or book.